6,880 others viewed this post. Long time subscribers will have seen me image this magnificent emission nebula last year, and I hope that you can see the improvements in my work since then! The “seagull” is too wide even for my widefield setup at 540mm magnification, it’s wings really extending out of frame. To be honest, it looks more like an Australian cockatoo to me! This photo is created with it’s natural salmon-pink colours as detected by my RGB CCD camera, and has an added lightness layer of Hydrogen Alpha to bring out the structure of the clouds. This object is not too far away from the famous Orion and Horsehead nebulas and is almost finished for this season, and will be back again next (Australian) summer. 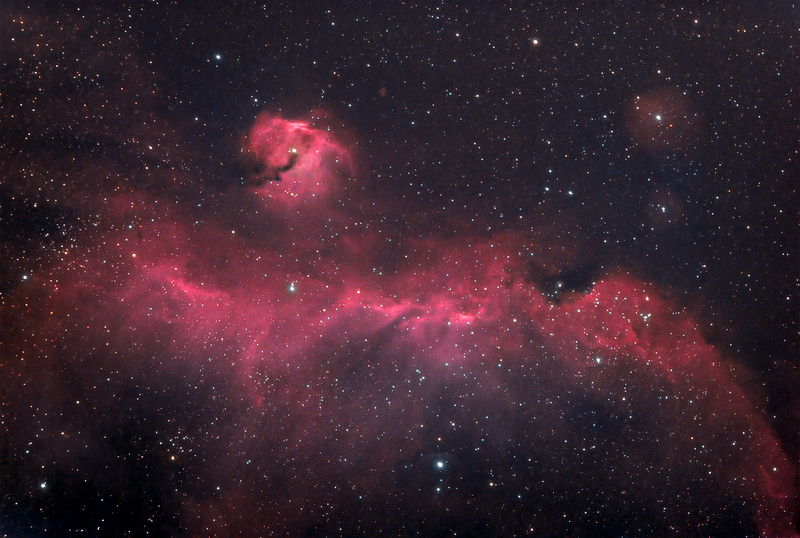 For the technically inclined, this is taken with 69 minutes of 3 minute exposures in RGB and 120 minutes of 3 minute exposures in Hydrogen Alpha. Using Celestron 9.25″ Edge HD & Hyperstar lens, QHY12 CCD and Baader Narrowband Filters & UHC Filter.